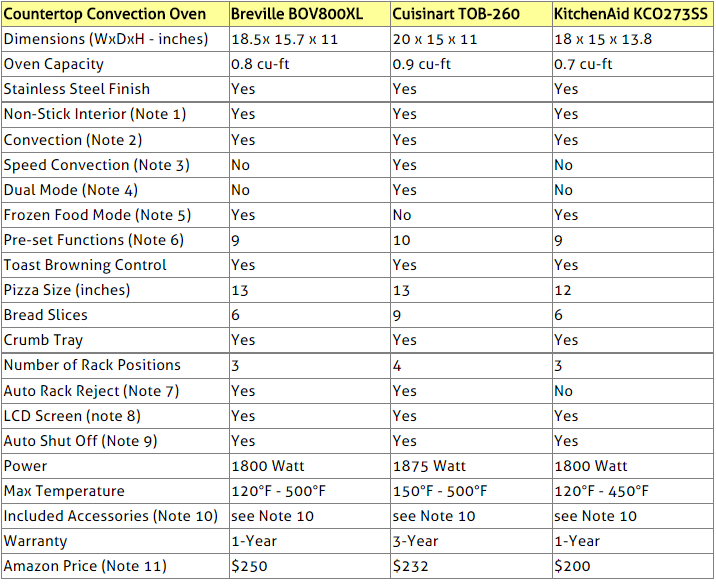 Compare Countertop Convection Toaster Ovens: Breville Smart Oven BOV800XL, Cuisinart Chef's TOB-260 or KitchenAid KCO273SS ? This article is NOT about ordinary toaster ovens! Yes, the toaster ovens that will be reviewed below can toast bread very well, but they do a lot more than just that! As a matter of fact, they come with just about every feature your energy consuming regular builtin oven offers, including convection cooking, and as such, the term "toaster oven" does not do justice to them. Note also that these are not microwave ovens, but true convection ovens with builtin heating elements to generate the heat required for cooking. They allow for "true" oven cooking in kitchens where a builtin oven is not available. They are the ideal solution for the tiny kitchens found in so many of the modern condo style apartments in our big cities which do not have enough space for a regular stove with a builtin oven. They save a lot of energy when compared to regular builtin ovens, and, in the long term, this can translate into considerable money savings. Finally, they can be quite useful as a second oven to allow you to become more efficient in the kitchen by being able to bake more than one dish at a time. Note that nowadays, there are also non-convection countertop toaster ovens that are superior to traditional toaster ovens. But this article will focus only on countertop convection ovens, as they are energy-wise more efficient, and they perform much better than non-convection units when it comes to speed and evenness of cooking. This article will compare the three most popular countertop convection toaster oven units bought by Amazon customers. They are the Breville Smart Oven BOV800XL, Cuisinart Chef's TOB-260 and KitchenAid KCO273SS. These three ovens were not just the most popular in their category at the time this article was written, but they had also received excellent reviews from Amazon customers with an average rating of 4.5 stars out of 5 stars for each! Note that Cuisinart has recently renamed the TOB-260 to TOB-260N1. But the two are practically identical in all respects. Only their prices are different. This article will use the the TOB-260 designation until no more ovens are available under that designation. Cuisinart convection ovens under both designations can be found in the Amazon section below. Countertop Convection Ovens on Amazon. Non-stick interiors make cleaning these three ovens a breeze. With convection cooking, a built-in fan circulates the hot air within the oven. This speeds the cooking process by stripping away the cold air that surrounds the food. Convection cooking cooks food faster and more evenly. All three ovens considered here provide convection cooking. Speed Convection is a feature exclusive to the Cuisinart oven that eliminates the need to preheat the oven. It cuts down on the cooking time since no preheating is needed. Dual Mode is a feature exclusive to the Cuisinart oven that allows to combine two different cooking functions (or two different temperatures within one cooking function), providing maximum flexibility in oven cooking. This feature is exclusive to the Breville and KitchenAid ovens and adds additional cycle time to the selected cooking mode to allow for thawing and proper cooking. The additional time varies depending on the selected cooking mode. Cuisinart: Toast, Bagel, Waffle, Bake, Broil, Roast, Pizza, Sandwich, Keep Warm and Leftover. The oven comes with these 10 functions already calibrated at settings for best results. However, these settings can be modified to match your own preferences. Note also that additional cooking modes can be created by using the Dual Mode and Speed Convection. KitchenAid: Bake, Pizza, Asado Roast, Toast, Broil, Cookie, Bagel, Keep Warm and Reheat. Again, memory settings can be modified to match your own preferences. With this feature, the rack pops out when door is opened making removal of cooked items very easy. This is a great safety feature that turns off the oven when the cooking time is up. Breville: A 12" non-stick pizza pan, one baking pan, one cooking rack and one broil rack. Cuisinart: A 13" pizza stone, 2 cooking racks, one baking pan and one broiling pan. KItchenAid: One 12" non-stick multipurpose pan, one broiling rack, one oven rack. So which of the three countertop convection ovens to buy? Here we have three excellent convection toaster ovens that at the time this article was written had received from Amazon customers an average rating of 4.5 stars each out of 5 stars! This simply means that you will probably be very happy with any one of them. However, as the feature comparison table above shows, there are some differences that you should consider before making up your mind. To help you in your decision, we will highlight below how each of these three ovens achieves the goal it was designed for - producing consistently perfect cooking results. Breville Smart Oven BOV800XL: This oven has a special design that recognizes that different foods require different cooking processes and heat distributions. For instance, when you cook a cake, it is important that it is cooked uniformly. But when you cook meats, you want the interior to stay tender and the exterior become crisp. This oven modifies the cooking process and heat distribution to produce results that match whatever it is you are cooking. This innovative capability is implemented through a new patented technology that is applied to the different cooking choices and functions found on the oven. Cuisinart Chef's TOB-260: This oven equips you with two very useful features, Dual Cook and Speed Convection that contribute in producing perfect results. Dual Cook enables you to combine any two cooking functions or two temperatures and run them consecutively. The feature allows you to program separate times and temperatures for each of the two different functions or program two different temperatures and times within the same function. This is ideal for those recipes that require multiple cooking steps. One great way to use the Dual Cook feature is to add Keep Warm to the end of a cooking function so any dish can be held at the proper serving temperature – perfect for the holidays and entertaining. Speed Convection is a special feature developed to cook your food even faster. It is recommended especially for frozen entrees, roasting vegetables and meats. KitchenAid Architect KCO273SS: The various cooking modes offered by this oven use the KitchenAid Even-Heat system to control a combination of elements, applying heat where it’s needed for producing optimal results. Memory settings allow you to customize the time and temperature in each mode to fit your specific needs. The oven will remember all your settings for the next use (until unplugged). By cycling different heating elements on and off, and using certain elements for only part of the cooking cycle, Even-Heat produces automatically perfect results. Please click the selected countertop convection oven to check the exact price or to purchase. Note that, as mentioned above, Cuisinart TOB-260 and TOB-260N1 are practically identical in all respects. Only their prices are different. Note also that Breville Smart Oven comes also in red color. When you click the link below, all existing colors will be offered. Update: KitchenAid has more recently produced a new version of their KitchenAid KCO273SS countertop convection oven: The KitchenAid KCO275SS. The main difference between KitchenAid KCO273SS and KitchenAid KCO275SS is that the interior of the KCO275SS has a CeramaShield coating which is non-stick, scratch resistant and PTFE/PFOA free.